This German Wespe 105mm le.FH 18/2 Fahrgestell auf Geschützwagen Pz.Kpfw. 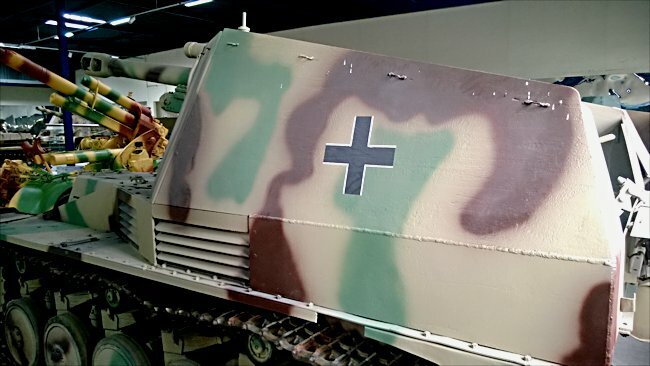 II self propelled artillery gun (Sd.Kfz.124) can be found at the French Tank Museum in Saumur in the Loire Valley. The Museum is called Musée des Blindés ou Association des Amis du Musée des Blindés, 1043, route de Fontevraud, 49400 Saumur, France www.museedesblindes.fr . The word Blindés means armoured. 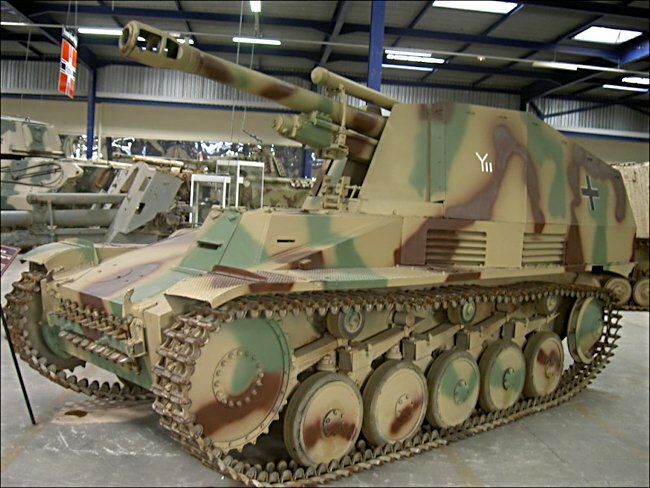 The Wespe 105mm self propelled artillery gun was based on a modified Panzer II chassis. This was not a tank destroyer. The standard artillery field gun employed by the German army on a divisional level from 1935 until the end of the war, was the 105mm FH18. 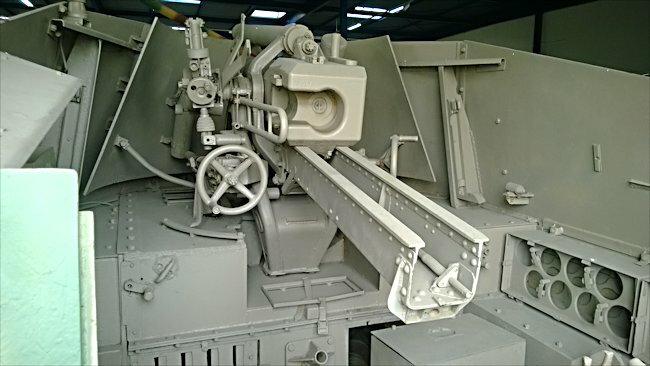 In 1939 a muzzle break was fitted to increase the range of the gun. It fired a 14.8kg round to a maximum range of 10,500m (6 1/2 miles). This piece saw service on every front during World War Two from the frozen wastes of northern Finland to the boiling deserts North Africa. The Wespe (wasp) self-propelled gun SdKfz 165 was designed in 1942 to carry the 105mm FH18 gun into battle. Prior to its appearance, horses, half tracks, lorries and pure brute strength was used to transport and position this large gun. It used a much modified Panzer II tank chassis. The Wespe SPG first saw action during operation Citadel on the Russian front in July 1943. It started to appear in growing numbers in the Panzer and Panzer Grenadier Divisions. The Wespe self propelled artillery gun cramped crew and 105mm gun compartment. The needs of the Russian front took priority. The highly mobile Panzer units needed quick moving artillery support as they were moved from one place to the next to combat Soviet break throughs. Deployed close to the front line, the Wespe self-propelled guns would provide an artillery barrage prior to an attack. They would then a company the armour as they moved forward. Whilst the Wespe was generally welcomed by its crew, it did have some faults. It had a four man gun crew. The Panzer II chassis used for this vehicle was quite small. This meant the gun and crew compartment was very cramped. It made it difficult to operate the gun. Like so many other open topped tracked vehicles, it did not offer much protection for the gun crew. The highest silhouette made it an easy target. The 676 that were produced served well through to the end of war. When the allies in landed in Normandy Wespe self-propelled guns were sent to the area to support counter-attacking German Panzer Divisions. The side armour on the Wespe SPG was thin and offered little protection. Where can I find other preserved Wespe SPGs?